Click the button below to add the ZZ3 Green Glow in the dark powder - larger particles to your wish list. 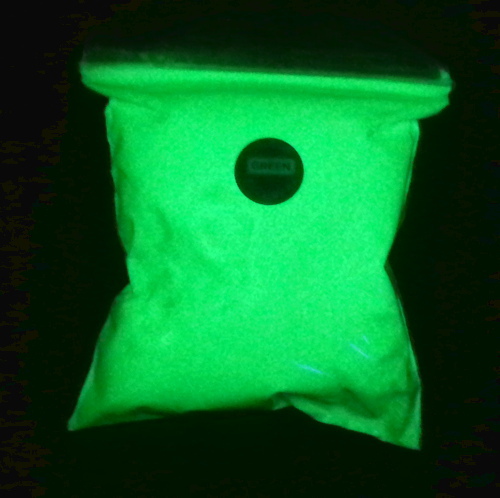 ZZ3 Green Glow in the dark powder. This is next generation Strontium Aluminate powder, providing faster charging times, better glow and longer lasting glow times. MADE FROM GREEN ZZ3 STRENGTH. The usual particle size for general glow in the dark paint is around 30-45um. However a larger particle size means a brighter glow and longer lasting glow (but not suitable for spray painting). Particles around 3 times bigger than standard and therefore it provides the better stronger Green glow.